Joe Buskuhl, FAIA is president of the Dallas Center for Architecture (DCFA) board of directors. A principal emeritus and former president of HKS, he has also served as president of AIA Dallas, on the board of the Texas Architectural Foundation, and on the executive committee of the AIA Large Firm Roundtable. 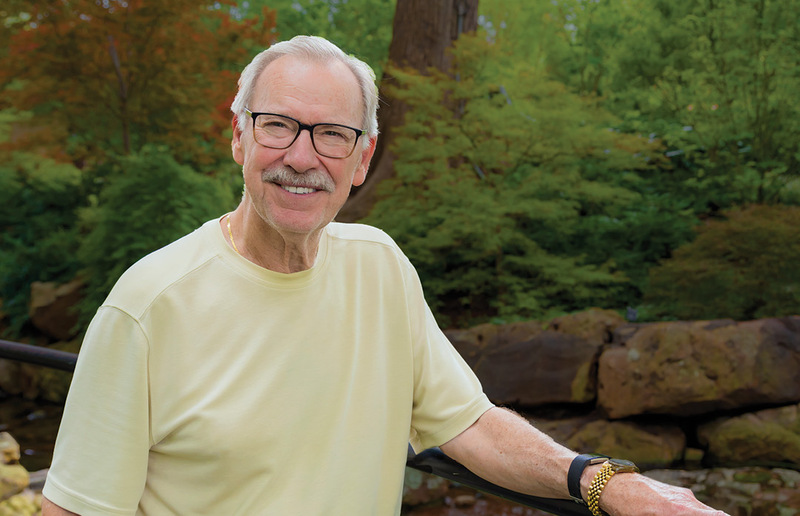 A graduate of the University of Oklahoma, Joe is past chair of the College of Architecture’s Board of Visitors, a distinguished alumnus and a Regents Award recipient. 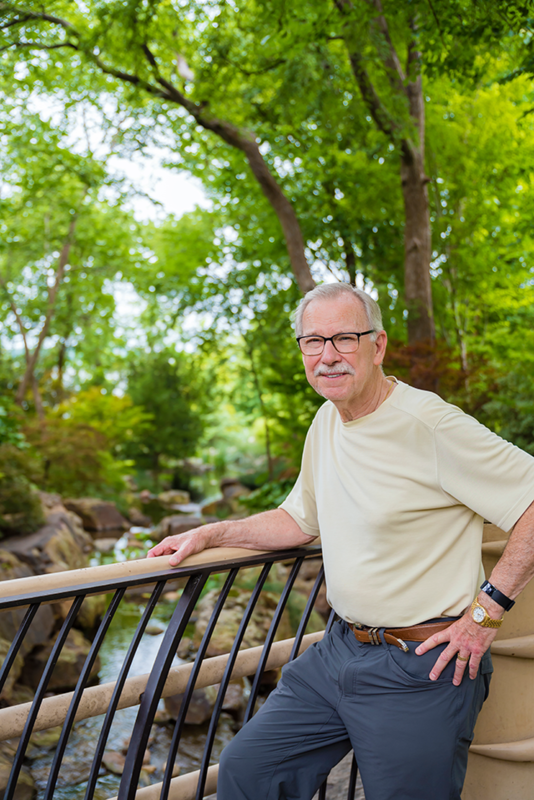 Joe is also an active volunteer at the Dallas Arboretum and Botanical Gardens, having served on the executive committee of the board. He is currently a member of the arboretum’s architecture and construction committee. The photos for this profile were taken at the arboretum. I grew up in the small rural community of Blackwell in northern Oklahoma. I enjoyed hunting, fishing, being outdoors, and playing golf, though we only had a nine-hole golf course. My dad was a contractor, so I did a variety of jobs. I have maintained close ties with the citizens of Blackwell and was honored to be inducted this year into the Blackwell Education Foundation Hall of Fame. The foundation was established to help support educational programming for the school district. As this year’s recipient, I was able to speak to the student body and encourage them that they, too, can achieve big dreams. Growing up, I enjoyed doing construction work with my dad, and I especially liked working on building houses. Though the houses in our town were not architecturally significant, working with him helped me to understand the processes involved in putting a house together. There was one house in Blackwell that belonged to friends of my family. They had engaged an architect to design it for them, and I enjoyed watching it as it was built. Though I don’t remember the architect’s name, I could tell that this house was a much better quality design than the other residences in town, and I could see the important differences an architect brought to the building process. Based on my interests and these experiences, I chose to study architecture. How did you decide to attend University of Oklahoma? What brought you to Dallas and to HKS? There wasn’t much work in Oklahoma when I graduated, so in 1964 I came to check out Dallas. I had married Jayne while a student at OU, so we started our new lives here in Dallas. I was hired at George Dahl’s firm when I arrived. At Dahl’s office, I was able to develop design and production skills, and also learn a lot about the business and technical sides of the profession. My career was interrupted by Vietnam. I was accepted in Officers Candidate School, which helped me develop leadership skills. I learned that it was important to train, equip, and empower people, which I was able to do with my troops as a lieutenant. I also learned the importance of getting the job done while keeping key people informed through the process. These were life lessons on how to take care of people that I continued to utilize throughout my career, whether in the military, on a project, or running a company. The more people I was able to make successful, the more successful I was able to become. When I returned home from Vietnam, I was hired by Harwood K. Smith and Partners, now HKS. You had an illustrious career at HKS—44 years—advancing from draftsman to project architect, then to project manager, and eventually to principal-in-charge. You were on the executive committee for 20 years and served as president for 14 years. While you were there, you worked on over 25 million square feet of projects on five continents. Those projects were valued at over $2.5 billion. What areas did you focus on at HKS, and what projects or initiatives at HKS did you find most rewarding? When I started at Harwood K. Smith and Partners in 1968, there were 38 people. I appreciated that Harwood let people do their job—he empowered us and expected results. In the 1970s, we added younger staff with great team spirit; they could accomplish anything a client wanted. Ron Skaggs was a mentor. He built and drove our health care division and HKS overall. I was involved in a lot of commercial projects, including banks, Plaza of the Americas, and others for developers including Lincoln, Vantage, and Paragon. Dallas-based developers took HKS nationwide as they expanded to other markets and let us design their projects in those cities. I was fortunate to be a principal-in-charge for high profile projects including Thanksgiving Tower and AT&T Stadium. I always kept at least one direct project while I was HKS’ president. I wanted to maintain contact with the process. We grew our sports, health care, commercial interiors, and hospitality divisions significantly during those years. Each project and each client was different and we approached each one with that in mind. There were many great projects, and I found children’s hospitals especially meaningful since we were creating spaces to save and heal young lives. Your wife, Jayne, was a remarkable woman who passed away this spring after a valiant battle with cancer. How did she encourage and support you in your career? Jayne was a true partner with me. When I was president of HKS, she organized all the company parties and special events. Our out-of-town employees and guests all came to our home before attending our annual Christmas party, and she knew almost all of our team. She started the Buskuhl Fun Run in the early ‘80s for HKS employees, which continued for 33 years. She kept things going on a positive note throughout our marriage. You and Jayne traveled to quite a few amazing places. What were some of your favorite trips? A camera safari in Africa and a trip through Antarctica are certainly at the top of the list. We also took each of our grandkids on a trip when they turned 12. Some of the places we went with them include London, Paris, and the Galapagos Islands. When we traveled through Europe, I was always looking at buildings. I didn’t have any favorite buildings, but enjoyed seeing them in their historical context. What advice would you give to a young architect just starting in practice? Speak up, and build on your areas of strength for the future. I have a strong interest in seeing young people achieve their full potential. What are the greatest challenges facing the architecture profession? We need to encourage architects to identify problems and develop solutions. At HKS, I sought to equip and empower young people in the firm to do this because they are the future. Developing the emerging leaders allows firms to have successful leadership transitions. Young people who are entering the profession can do well if they are talented, motivated, and driven to succeed. An advantage that today’s generation has is the knowledge of how to use technology in producing work. What have been your primary goals for your term as board president of the Dallas Center for Architecture? What inspires you as an architect? The people we work with, the HKS team, and the AIA and DCFA. I also am inspired by seeing people I have mentored and worked with develop and become successful leaders. Who are some of the architects that influenced you? I worked on projects with important design firms including Johnson Burgee, Pelli Clarke Pelli and Kohn Pedersen Fox Associates. All of the firms were different and I was able to learn from each one. As a member of the executive committee of the AIA’s Large Firm Roundtable, I was able to interact with Harold Adams (at RTKL at the time), Jerry Sincoff (HOK), and Ed Friedrichs (Gensler). Our focus wasn’t about projects, but we could discuss how to manage large firms. What guests, living or deceased, would you have at your ideal dinner party? I would reconvene a meeting of The Emeriti, a group of Dallas architects who met periodically to enjoy each other’s company and talk about life. The group was Bill Booziotis, FAIA; Dave Braden, FAIA; Jack Craycroft, FAIA; Vel Hawes, FAIA; Howard Parker, FAIA; Jim Pratt, FAIA; Pat Spillman; and myself. One of the things I enjoyed most about the group was that the members were knowledgeable and had opinions without being opinionated. Over time members have died or become unable to attend and the group has quit meeting. I would love to be able to get them together one more time for an evening of lively conversation. Interview conducted by Nate Eudaly, Hon AIA Dallas, executive director of The Dallas Architecture Forum.